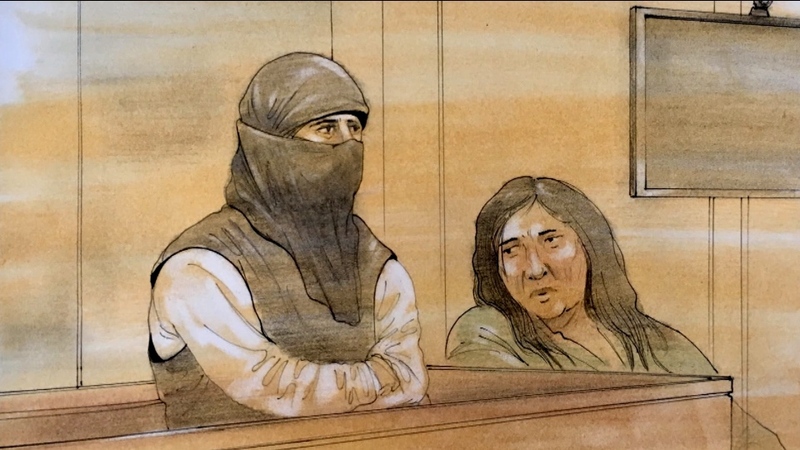 TORONTO -- A Toronto woman convicted of terror charges grew increasingly preoccupied with the notion that the Canadian government was spying on her in the years before she carried out an attack at a Canadian Tire while draped in an ISIL banner. In a newly released psychiatric report, Rehab Dughmosh said she first began to feel persecuted by authorities in 2013, when she tried to obtain her Canadian citizenship and was turned away for refusing to remove her niqab in court. Shortly afterwards, Dughmosh heard about ISIL on the news and started watching their videos daily, which she felt caused the government to increase its surveillance of her, according to the report, which was issued last fall and sealed until now. The 34-year-old became "increasingly distressed" because she believed the government had placed cameras in her home, prompting her to put tinfoil on light fixtures and cover up electrical sockets and vents, the report says. In early 2016, she began to hear voices she believed were from the government, and which told her to hurt herself and others, the report says. In one instance, her anguish over the voices led her to try to remove one of her teeth with a knife, an injury that left her with a dead tooth, it says. "The worsening of her psychotic state over time resulted in severe functional decline and adverse interpersonal consequences, as manifested by her social withdrawal, failure to adequately manage her household/familial responsibilities, and marital demise," the document reads. "Her behaviour was concerning and impairing to such a degree that her family made repeated unsuccessful attempts to connect her with psychiatric care prior to the June 2017 index offences." Dughmosh's adoption of extreme religious views coincided with the start of her illness, but does not "directly flow" from her mental disorder, the report says. "In the context of an evolving delusional process and corresponding confusion and distress, the adoption of a new or exaggerated belief system serves to provide a more stable sense of self at a time when self-concept and personality are undergoing significant changes," it says. While Dughmosh appeared able to appreciate the nature and quality of her actions at the time, she was also in the grips of psychosis, experiencing "paranoid and persecutory delusions" that caused her intense distress and may have robbed her of the ability to consider other options, the document says. "She was viewing the world through the distorted lens of a paranoid individual who was increasingly feeling anger, despair and helplessness," it said. "Through this lens, while having a general understanding of the moral wrongfulness of her actions, it is possible that she was unable to rationally apply this understanding to her decisions." The report, which was presented as evidence Monday as an Ontario judge begins to determine an appropriate sentence, did not rule out that Dughmosh could be found not criminally responsible for her actions and said she will need ongoing treatment for her mental illness. Ontario Superior Court Justice Maureen Forestell said she will examine assessments already conducted and decide whether any additional ones are required. A sentencing hearing will be held at a later date. Dughmosh objected to having the report unsealed Monday, saying through an interpreter that she did not want Forestell to read it because she had "provided misleading and false statements" during the assessment. Crown prosecutors, who suggested the judge review the report, said they found it contained some "problematic findings" that they dispute. They said, however, that it has always been their position that Dughmosh had a mental illness at the time of the attack and it should be a mitigating factor in sentencing. She was also found guilty on another charge related to a failed attempt to join ISIL in Syria in 2016. An agreed statement of facts read in court last week -- the only evidence presented to jurors -- said Dughmosh began contemplating an attack in Toronto about a year after her return from that trip. The document said she built an arsenal of makeshift weapons but her estranged husband confiscated them at the last minute and she was forced to change her plans. She went to Canadian Tire intending to purchase more weapons but discovered she hadn't brought her wallet, causing her to change course again and carry out the attack in the store with a golf club she found in the sporting goods section and a butcher knife she had smuggled under her robe, it said. Dughmosh, who represented herself and participated only minimally in her legal proceedings, was found fit to stand trial.